Objective: To assess the prevalence, risk factors, presenting features, and in-hospital outcomes of acute coronary syndrome (ACS) patients ≤40 years of age from Oman. Methods: Data were analyzed from 1579 consecutive ACS patients from Oman during May, 2006 to June, 2007, as part of Gulf RACE (Registry of Acute Coronary Events). ACS patients ≤40 years of age were compared with patients >40 years of age. Results: A total of 121 (7.6%) patients were ≤40 years of age with mean age of 36 ± 4 vs. 61 ± 11 years in young and old adults, respectively (P<0.001). More men were seen in the younger age group (81 vs. 60%; P<0.001). Among all the coronary risk factors, young patients had more history of smoking (47 vs. 15%; P<0.001), obesity (72 vs. 58%; P = 0.009), and family history of coronary artery disease (CAD) (16 vs. 7%; P = 0.001). Both groups received aspirin, statins, thrombolytic therapy, and anticoagulants equally; however, younger patients received clopidogrel, glycoprotein IIb/IIIa inhibitors, b-blockers, and in-hospital coronary angiogram more. Younger patients experienced less heart failure (6 vs. 27%; P<0.001) and in-hospital mortality, especially among STEMI patients (0 vs. 10%; P = 0.037). Conclusions: Young ACS patients from Oman have different risk profile. They were treated more aggressively and their outcome was better, which is similar to other populations. However, smoking, along with obesity and family history of CAD were strong risk factors in the young Omani ACS patients. There is a need for prevention programmes to control smoking and obesity epidemic by targeting young adults in the population. Most of the studies involving young ACS patients are reported from Western countries and presently, there is no contemporary data on the prevalence, risk factors, clinical characteristics, and outcome of such patients in the Middle-East countries and even in Oman. Thus, the Gulf Registry of Acute Coronary Events (RACE) provides a unique database to study the demographic and clinical profile of young patients with ACS in Oman. The aim of this study was to assess the prevalence, risk factors, presenting features, and in-hospital outcomes of ACS patients ≤40 years of age from Oman. In this study, we analyzed data from 1579 consecutive patients from Oman enrolled in a prospective ACS registry from the Middle East (Gulf RACE). Gulf RACE is a multinational, multicentre, prospective registry of consecutive patients above 18 years of age hospitalized with the final diagnosis of ACS (unstable angina, ST-elevation myocardial infarction [STEMI], and non-STEMI) from various hospitals in six Middle Eastern countries. There were no exclusion criteria. Recruitment was done from May 8, 2006 to June 6, 2006 and from January 29, 2007 to June 29, 2007 for a period of six months. Fifteen hospitals across Oman participated. Methods of Gulf RACE have been described previously. Demographic and other baseline clinical characteristics of the patients along with in-hospital management were evaluated. Diabetes was defined as having a history of diabetes diagnosed and/or treated with medication and/or diet or fasting blood glucose 7.0 mmol/l (126 mg/dl) or greater. Hypertension was defined as having a history of hypertension diagnosed and/or treated with medication, diet, and/ or exercise, blood pressure greater than 140 mmHg systolic or 90 mmHg diastolic on at least two occasions, or as receiving any antihypertensive drug. Hyperlipidemia was defined as history of dyslipidemia diagnosed and/or treated by a physician or total cholesterol greater than 5.18 mmol/l (200 mg/dl), low-density lipoprotein greater than or equal to 3.37 mmol/l (130 mg/dl), or high-density lipoprotein <1.04 mmol/l (40 mg/dl). Current smoker was defined as a person smoking cigarettes within 1 month of index admission. A positive family history for CAD was defined as evidence of CAD in a parent, sibling, or children before 55 years of age. Obesity was defined as body mass index greater than 25 kg/m 2 . Renal impairment was defined as serum creatinine of >176.8 μmol/l (2 mg/dl). Diagnosis of the different types of ACS and definitions of data variables and outcome parameters were based on the American College of Cardiology clinical data standards. In the current study, we stratified the cohort into younger (40 years of age and younger) and older (older than 40 years of age) groups. Outcome parameters evaluated during the hospital stay included in-hospital mortality, recurrent ischemia/re-infarction, heart failure, major bleed, and stroke. Institutional review board approval was obtained. Descriptive statistics were used to describe the data. For categorical variables, frequencies and percentages were reported. Differences between groups were analyzed using Pearson's χ2 tests (or Fisher's exact tests for cells <5). For continuous variables, means and standard deviations were presented and analyses were conducted using Student's t-test. An a priori two-tailed level of significance was set at the 0.05 level. Statistical analyses were conducted using STATA version 11.1 (STATA Corporation, College Station, TX). A total of 1579 patients were enrolled in the study. [Table 1] shows the demographic and baseline clinical characteristics of the patients. In this study, 121 (7.6%) of the patients were ≤40 years of age with mean age 36 vs. 61 years in young and old adults, respectively (P<0.001). More men were seen in the younger age group (81 vs. 60%; P<0.001). Older patients had higher frequencies of diabetes (38 vs. 28%; P = 0.033), hypertension (55 vs. 29%; P<0.001), hyperlipidemia (36 vs. 16%; P<0.001), prior angina (50 vs. 21%; P<0.001), aspirin use (50 vs. 17%; P<0.001), chronic obstructive pulmonary disease (COPD) (5.2 vs. 0.8%; P = 0.026), renal impairment (38 vs. 04%; P<0.001), and prior stroke (3.8 vs. 00%; P = 0.019), but less history of smoking, obesity, and family history of CAD, which were high among younger patients (47 vs. 15%; P<0.001, 72 vs. 58%; P = 0.009, and 16 vs. 7%; P = 0.001, respectively). When compared with older patients, younger patients were significantly more likely to have ischemic chest pain (85 vs. 72%; P = 0.002) and Killip class I (92 vs. 73%; P<0.001), but less likely to use ambulance to arrive at hospitals (25 vs. 39%; P = 0.002). More patients in the older group presented with Killip class II, III, IV (27 vs. 8%; P<0.001) and dyspnea (14 vs. 03%; P<0.001). There were no differences in the prevalence of STEMI, non-STEMI, or unstable angina among young and older patients. 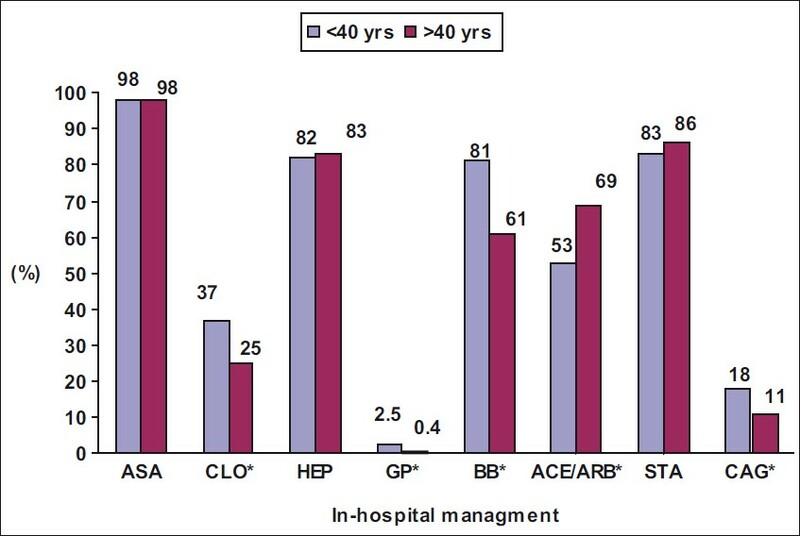 [Figure 1] and [Figure 2] show in-hospital management of the cohort. Both groups received aspirin, statins, thrombolytic therapy, and anticoagulants equally; however, younger patients received clopidogrel (37 vs. 25%; P = 0.003), glycoprotein IIb/IIIa inhibitors (2.5 vs. 0.4%; P = 0.026), b-blockers (81 vs. 61%; P<0.001), in-hospital coronary angiogram (18 vs. 11%; P = 0.012) more, and angiotensin-converting enzyme inhibitors (ACEIs) or angiotensin II receptor blockers (ARBs) less (53 vs. 69%; P<0.001). [Figure 2] presents missed opportunities for thrombolysis in young and older adults with ACS. When compared with younger patients, older patients presented late (>12 hours) after chest pain (25 vs. 10%; P = 0.046), but there was no differences in the use of thrombolysis when indicated. [Table 2] shows the complications encountered by the patients. Younger patients experienced less heart failure (6 vs. 27%; P<0.001) and significantly less in-hospital mortality, especially among STEMI patients (0 vs. 10%; P = 0.037). In this study, 7.6% of patients with ACS in Oman were ≤40 years of age. In the Global Registry of Acute Coronary Events (GRACE) study, the prevalence of young ACS patients was 6.3%;  in the Thai ACS Registry, it was 5.8%;  and in the Spain registry, it was 7%. This study shows that ACS in young patients occurs predominantly in men and this has also been noted in majority of populations, ,,,,,,,, suggesting that women are protected from developing ACS until menopause. Older patients had higher frequencies of multiple risk factors compared with younger patients, except for smoking, obesity, and family history of CAD. The high incidences of smoking, obesity, and family history in the young ACS patients in Oman are consistent with the results in previous reports, ,,,,,,,, except for hyperlipidemia which was low among young adults in Oman. Smoking is an established and a predominant major risk factor in young ACS patients, being reported between 70 and 90% in the previous studies. ,,,,,,,, Smoking is known to cause increased fibrinogen concentrations and platelet aggregability, along with impaired fibrinolytic activity, decreased coronary flow reserve, and increased vasospasm. , Recurrent exposure to cigarettes with subsequent catecholamine surges damage endothelial cells, leading to endothelial dysfunction and injury of the vascular intima. Autopsy studies in young adults have showed that the extent of fatty-streak lesions in the coronary arteries of young adults was higher in smokers than in nonsmokers. 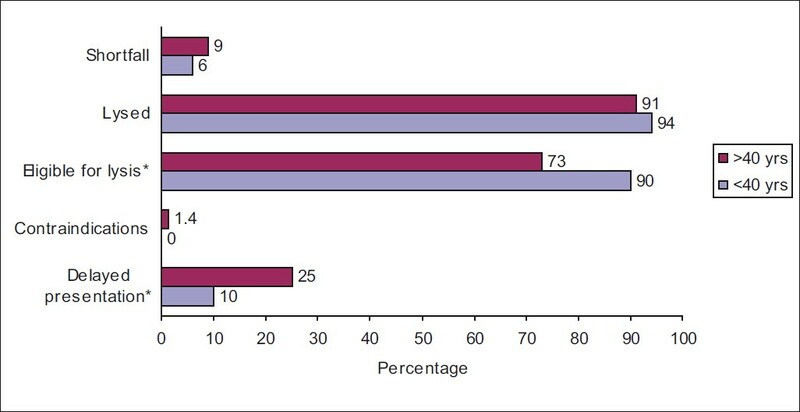 Even though smoking was the predominant risk factor in young ACS patients from Oman, its prevalence was low at 47% when compared with other population. Although this discrepancy cannot be explained precisely, it is possible that cultural and gender factors may be involved. It has been documented that children born of parents with premature CAD tend to have more lipid abnormalities, insulin resistance, and obesity, strengthening the belief of a common genetic linkage and genetic polymorphisms,  indicating that family history of CAD is an important risk factor in young adults with ACS. Interestingly, hyperlipidemia was low in young adults with ACS from Oman. This has been noted in previous studies. , Jee et al. noted similar rates of cardiac events in young adults with ACS between the low-cholesterol and high-cholesterol groups to mean that low cholesterol confers no benefits against smoking-related atherosclerotic cardiovascular disease. In the previous studies, ,,, STEMI was more frequent in the young patients, whereas non-STEMI was in the elderly. However, in this study, there were no differences between the types of ACS among young and old adults presenting with ACS. These findings suggest that the pathophysiology in these two types of ACS may not be that different in young adults. In the present study, both groups received aspirin, statins, thrombolytic therapy, and anticoagulants equally, indicating that evidence-based therapies were prescribed adequately. However, younger patients received clopidogrel, glycoprotein IIb/IIIa inhibitors, β-blockers, and in-hospital coronary angiogram more, indicating an aggressive approach toward young adults with ACS or presence of contraindications in the elderly. This bias has been noted in other studies as well. ,, In this study, younger adults with ACS received ACEIs or ARBs less when compared with older adults, probably because of the lower prevalence of previous cardiovascular disease, diabetes, and heart failure during hospitalization. The major limitation of our study is its observational and retrospective analysis of a prospective registry and the possible confounding variables not controlled for in the study. We report only in-hospital outcome, which may be inadequate to assess the true burden of premature coronary disease in Oman. We evaluated the standard coronary risk factors; other newer risk factors such as lipoprotein abnormalities, hypercoagable states, and elevated homocysteine levels were not studied. Furthermore, non-atherosclerotic coronary disease, which should be considered in young patients with ACS, was not evaluated. Oman has a significant young ACS population with a mean age of 36 years. They had different risk profile, were treated more aggressively, and their outcome was better, which is similar to other populations. Nearly half of young ACS patients were smokers, which was relatively low compared with other countries. However, smoking along with obesity and family history of CAD were strong risk factors in the young Omani ACS patients. There is a need for prevention programs to control smoking and obesity epidemic by targeting young adults in the population. The Gulf RACE registry is a Gulf Heart Association project supported by Sanofi-Aventis, Paris, France and Qatar Telecommunications Company, Doha, Qatar. The sponsors had no role in study design; in the collection, analysis, and interpretation of data; in the writing of the report; and in the decision to submit the paper for publication. 1. Imazio M, Bobbio M, Bergerone S, Barlera S, Maggioni AP. Clinical and epidemiological characteristics of juvenile myocardial infarction in Italy: The GISSI experience. G Ital Cardiol 1998;28:505-12. 2. Doughty M, Mehta R, Bruckman D, Das S, Karavite D, Tsai T, et al. Acute myocardial infarction in the young-The University of Michigan experience. Am Heart J 2002;143:56-62. 3. Shiraishi J, Kohno Y, Yamaguchi S, Arihara M, Hadase M, Hyogo M, et al. AMI-Kyoto Multi-Center Risk Study Group. Acute myocardial infarction in young Japanese adults. Circ J 2005;69:1454-8. 4. Avezum A, Makdisse M, Spencer F, Gore JM, Fox KA, Montalescot G, et al. Impact of age on management and outcome of acute coronary syndrome: Observations from the Global Registry of Acute Coronary Events (GRACE). Am Heart J 2005;149:67-73. 5. Tungsubutra W, Tresukosol D, Buddhari W, Boonsom W, Sanguanwang S, Srichaiveth B; Thai ACS Registry. Acute coronary syndrome in young adults: The Thai ACS Registry. J Med Assoc Thai 2007;90:81-90. 6. Morillas P, Bertomeu V, Pabón P, Ancillo P, Bermejo J, Fernández C, et al. Characteristics and outcome of acute myocardial infarction in young patients. The PRIAMHO II study. Cardiology 2007;107:217-25. 7. Pineda J, Marín F, Roldán V, Valencia J, Marco P, Sogorb F. Premature myocardial infarction: Clinical profile and angiographic findings. Int J Cardiol 2008;126:127-9. 8. Anderson RE, Pfeffer MA, Thune JJ, McMurray JJ, Califf RM, Velazquez E, et al. High-risk myocardial infarction in the young: The VALsartan In Acute myocardial iNfarcTion (VALIANT) trial. Am Heart J 2008;155:706-11. 9. Chua SK, Hung HF, Shyu KG, Cheng JJ, Chiu CZ, Chang CM, et al. Acute ST-elevation myocardial infarction in young patients: 15 years of experience in a single center. Clin Cardiol 2010;33:140-8. 10. Zubaid M, Rashed WA, Al-Khaja N, Almahmeed W, Al-Lawati J, Sulaiman K, et al. Clinical presentation and outcomes of acute coronary syndromes in the gulf registry of acute coronary events (Gulf RACE). Saudi Med J 2008;29:251-5. 11. Cannon CP, Battler A, Brindis RG, Cox JL, Ellis SG, Every NR, et al. American College of Cardiology key data elements and definitions for measuring the clinical management and outcomes of patients with acute coronary syndromes. A report of the American College of Cardiology Task Force on Clinical Data Standards (Acute Coronary Syndromes Writing Committee). J Am Coll Cardiol 2001;38:2114-30. 12. Lang NN, Gudmundsdóttir IJ, Boon NA, Ludlam CA, Fox KA, Newby DE. Marked impairment of protease-activated receptor type 1-mediated vasodilatation and fibrinolysis in cigarette smokers: Smoking, thrombin, and vascular responses in vivo. J Am Coll Cardiol 2008;52:33-9. 13. Morita K, Tsukamoto T, Naya M, Noriyasu K, Inubushi M, Shiga T, et al. Smoking cessation normalizes coronary endothelial vasomotor response assessed with 15O-water and PET in healthy young smokers. J Nucl Med 2006;47:1914-20. 14. Berenson GS, Srinivasan SR, Bao W, Newman WP 3 rd , Tracy RE, Wattigney WA. Association between multiple cardiovascular risk factors and atherosclerosis in children and young adults. The Bogalusa Heart Study. N Engl J Med 1998;338:1650-6. 15. Harpaz D, Behar S, Rozenman Y, Boyko V, Gottlieb S; Israeli Working Group on Intensive Cardiac Care, Israeli Heart Society. Family history of coronary artery disease and prognosis after first acute myocardial infarction in a national survey. Cardiology 2004;102:140-6. 16. Jee SH, Suh I, Kim IS, Appel LJ. Smoking and atherosclerotic cardiovascular disease in men with low levels of serum cholesterol. JAMA 1999;282:2149-55. 17. Akosah KO, Cerniglia RM, Havlik P, Schaper A. Myocardial infarction in young adults with low-density lipoprotein cholesterol levels < or = 100 mg/dL: Clinical profile and 1-year outcomes. Chest 2001;120:1953-8. 18. Egred M, Viswanathan G, Davis GK. Myocardial infarction in young adults. Postgrad Med J 2005;81:741-5. 19. Colkesen AY, Acil T, Demircan S, Sezgin AT, Muderrisoglu H. Coronary lesion type, location, and characteristics of acute ST elevation myocardial infarction in young adults under 35 years of age. Coron Artery Dis 2008;19:345-7. 20. Badran HM, Elnoamany MF, Khalil TS, Eldin MM. Age-related alteration of risk profile, inflammatory response, and angiographic findings in patients with acute coronary syndrome. Clin Med Cardiol 2009;3:15-28. 21. Iribarren C, Sidney S, Bild DE, Liu K, Markovitz JH, Roseman JM, et al. Association of hostility with coronary artery calcification in young adults: The CARDIA study: Coronary artery risk development in young adults. JAMA 2000;283:2546-51. 22. Schoenenberger AW, Radovanovic D, Stauffer JC, Windecker S, Urban P, Niedermaier G, et al. Acute coronary syndromes in young patients: Presentation, treatment and outcome. Int J Cardiol 2009[In Press]. 23. Ergelen M, Uyarel H, Gorgulu S, Norgaz T, Ayhan E, Akkaya E, et al. Comparison of outcomes in young versus nonyoung patients with ST elevation myocardial infarction treated by primary angioplasty. Coron Artery Dis 2010;21:72-7. 24. Mukherjee D, Hsu A, Moliterno DJ, Lincoff AM, Goormastic M, Topol EJ. Risk factors for premature coronary artery disease and determinants of adverse outcomes after revascularization in patients ≤40 years old. Am J Cardiol 2003;92:1465-67. 25. Fournier JA, Cabezón S, Cayuela A, Ballesteros SM, Cortacero JA, Díaz De La Llera LS. Long-term prognosis of patients having acute myocardial infarction when ≤ 40 years of age. Am J Cardiol 2004;94:989-92. 26. Rallidis LS, Lekakis J, Panagiotakos D, Fountoulaki K, Komporozos C, Apostolou T, et al. Long-term prognostic factors of young patients (< or=35 years) having acute myocardial infarction: The detrimental role of continuation of smoking. Eur J Cardiovasc Prev Rehabil 2008;15:567-71. 27. Klein LW, Nathan S. Coronary artery disease in young adults. J Am Coll Cardiol 2003;41:529-31.